Taiwanese President Tsai Ing-wen appointed a close political ally as premier during a Cabinet reshuffle Friday following the ruling party's heavy election losses and growing pressure from rival China. Su Tseng-chang took charge of the Cabinet amid tense relations with Beijing, which threatens to use force to take control of the island it claims as its own. China responded to Tsai's 2016 victory by cutting all contacts with her government and has ratcheted up economic and diplomatic pressure on the self-governing democracy. The opposition Nationalist Party, which favors closer ties with Beijing, won 15 of 22 major seats in the Nov. 24 local elections, including in the ruling Democratic Progressive Party's southern stronghold of Kaohsiung. Soon after, Tsai resigned as chair of the DPP, which rejects China's demands for unification with the mainland. Analysts attributed the DPP's election losses to disappointment with the performance of Tsai's government, which had won a broad mandate, including seizing a majority in the legislature from the Nationalists for the first time since full democracy was attained three decades ago. "The people expect us to improve livelihoods. The people expect us to protect democracy. The people expect us to safeguard sovereignty," Tsai said at a ceremony at the Presidential Office Building. "These challenges need an experienced premier such as Su Tseng-chang to overcome." 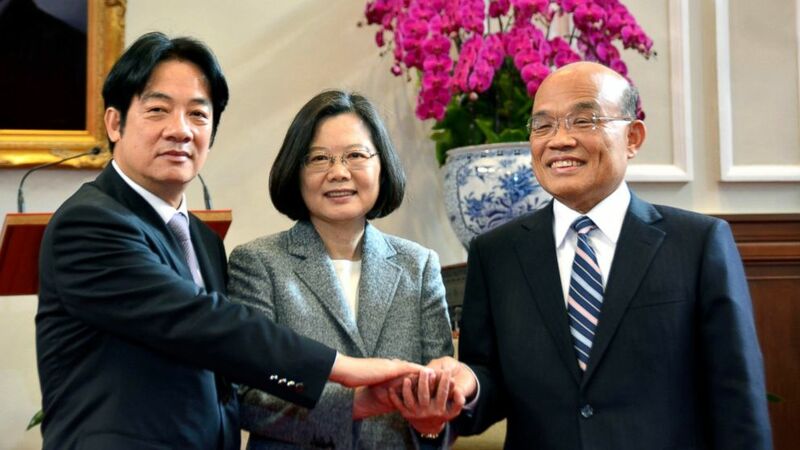 Su thanked Tsai for her trust and support, adding, "Now, I will lead the team and roll up my sleeves to satisfy the people's expectations and respond to people's interests." China's pressure campaign has increased Taiwan's international isolation, reducing its number of diplomatic allies to just 17, excluding its representatives to international gatherings, and forcing international companies to designate Taiwan as a part of China. Chinese President Xi Jinping renewed the threat of invasion in a Jan. 2 address, saying the ruling communists "made no promises to abandon the use of force." The island's high-tech economy continues to grow at a sluggish pace, and salaries for graduates have remained flat, increasing the lure of opportunities in China. Efforts at pension and fiscal reform have also been unpopular. He previously served as premier in 2006-07, as well as party chairman, legislator and county magistrate.